The “Great Oxidation Event” (GOE) occurred about 2.5–2.2 billion years ago, when oxygen levels in the atmosphere began to rise up to 10,000 times, reaching up to 1% of the present level. The rise across GOE and the subsequent increases in Earth’s atmospheric oxygen enabled the emergence of multicellular organisms, finally leading to plants, dinosaurs, and primates. A combination of factors led to the GOE, including the actions of oxygen-producing cyanobacteria in the oceans and the burial of dead organic matter. A new paper by DCO Extreme Physics and Chemistry and Reservoirs and Fluxes Community member Rajdeep Dasgupta (Rice University, USA) and Megan Duncan (now at the Carnegie Institution for Science, USA) proposes that subduction, the descent of the tectonic plates into the mantle, was a key process in the efficient, long-term storage of reduced carbon, making the GOE possible. Using high-temperature and high-pressure experiments combined with thermodynamic models, the researchers looked back in time to model how carbon ‘burial’ would impact atmospheric oxygen levels. They describe their findings in a new paper in the journal Nature Geoscience . One way carbon is brought back to the surface is through the outgassing at volcanoes. To estimate the impact of volcanic eruptions, especially at subduction zones, Duncan and Dasgupta measured the ability of water-bearing, silica-rich magma that forms from the downgoing plate to dissolve graphite, the remnants of organic carbon. Even under the hotter conditions of early subduction zones, the magma did not dissolve enough of the carbon to prevent it from becoming buried deep in the mantle. 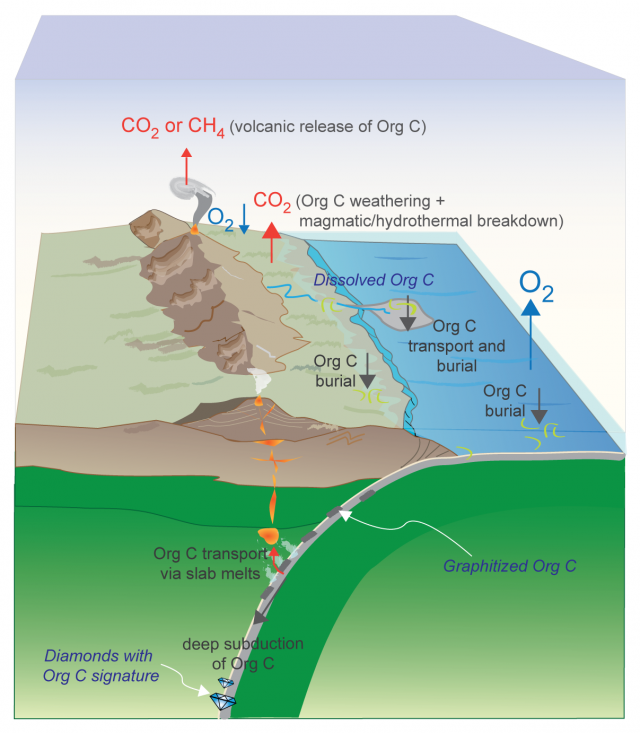 Duncan and Dasgupta found they could model the rise of oxygen by taking into account the efficiency of deep carbon burial into the mantle and the plausible rates of subduction through time. 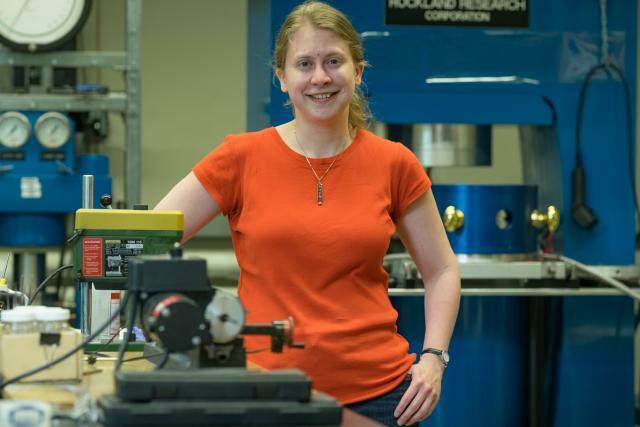 “Subduction is a key way to add carbon to the mantle fairly early in Earth’s history,” said first author Megan Duncan. Knowledge of this process can reveal details of what occurred in the mantle through time, including the formation of diamonds. People have discovered diamonds dated to 2–3 billion years ago with subduction signatures associated with light carbon isotope signatures, a potential indication that the diamond formed from once-living cells. Early subduction carried the organic matter of single-celled organisms into the mantle, the carbon turned into graphite and then became diamonds at depths greater than 120 km.